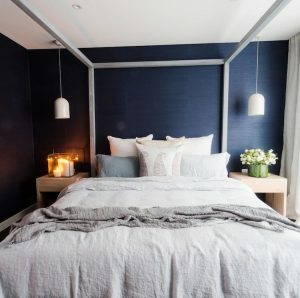 A bedroom should be a place to relax and unwind after a busy day. This requires mood lighting, such as pendants or lamps, that can not only provide appropriate reading light but can also set a calm atmosphere. Dimmable ceiling lights are also ideal. Large windows and natural light will make the space look extremely welcoming during the day, however it’s important to have the right window coverings such as block out blinds that can be mixed with soft and textured fabric curtains to allow for those restful sleep-ins. The most ideal placement of your bed should be opposite the door so that you are able to get the full impact of your perfectly styled oasis. Bedsides can be the same on both sides to create symmetry and balance which often creates a feeling of harmony in the bedroom. You can however mix and match bedsides, particularly if you have a small bedroom. 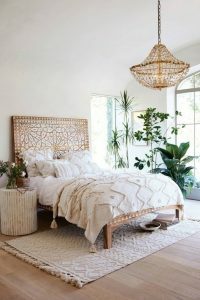 A great idea is to have one bedside which isn’t overly bulky and have a large floor lamp or hanging pendant on the other side for a more eclectic relaxed feel. 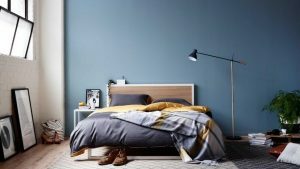 If the space allows it, other furniture additions to the bedroom can be an occasional chair, chest of draws or even a dedicated sectioned off area with a large chase lounge complete with rug and accessories. The most important thing is to consider your space as you need enough room to comfortably move around in but not too much space that it feels uninviting. 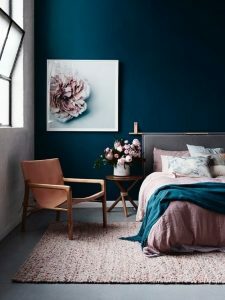 Colour and texture are the most important design elements of a bedroom. These set the mood of the whole space and bring everything together. Soft and muted colours are ideal for bedrooms as they are non-offensive and allow the eyes to rest. If these aren’t your style then you can opt for darker colours but make sure there is enough contrast and texture to soften the darkness. Use highly textured throws in winter and softer linens for summer mixed with carefully selected cushions, beautiful scents and an artwork that makes you happy! Add plants either on your bedside, by the floor or even try hanging a plant in the corner of the room. Plants provide cleaner air inside the home and can boost your mood as well as make you feel calm and relaxed – ideal for waking up in the morning and going to bed at night. A focal point can be an eye-catching piece of artwork hung above the bed, a cluster of prints in different sizes leaning against a wall, a large round rug positioned partially under the bed or even beautiful cabinetry that takes centre stage.